クローテン in German, French and Italian in the online Historical Dictionary of Switzerland. 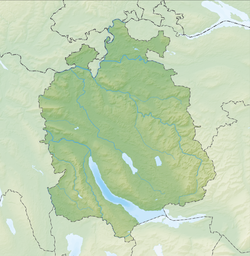 ^ a b Kloten in German, French and Italian in the online Historical Dictionary of Switzerland. ^ "Kloten." Ortspläne Schweiz. Retrieved on 2 October 2009. ^ "Swiss International Air Lines Zurich." Swiss International Air Lines. Retrieved on 24 September 2009. ^ "The head office of Swiss WorldCargo is located within the corporate headquarters of SWISS International Air Lines, in Zurich-Kloten, in close proximity to Zurich International Airport." and "How to find us by public transport: - From Zurich Airport take the 737 bus to “Obstgartenstrasse” (final stop of the bus line). - The bus stops right in front of the SWISS headquarters main entrance." and "MAILING adDress Swiss WorldCargo Swiss International Air Lines Ltd. PO Box ZRHLX/CSM 8058 Zurich Airport Switzerland" Swiss World Cargo. Retrieved on 17 September 2011. ^ "Map." Swiss World Cargo. Retrieved on 17 September 2011. "SWISS INTERNATIONAL AIR LINES AG 3TOPS GEBÄUDE ALPHA + BRAVO OBSTGARTENSTRASSE 25, 8302 KLOTEN ÜBERSICHTSPLAN"
^ "Contact." Swiss Private Aviation. Retrieved on 12 January 2010. "Swiss PrivateAviation AG Obstgartenstr. 25 8058 Zurich-Airport Switzerland"
^ "Schule Kloten Online." Schule Kloten. Retrieved on 29 September 2009.